The cornerstone of any medical intervention is a sound diagnosis. Accurate diagnosis guides the proper treatment, while an incorrect diagnosis might subject a patient to unnecessary procedures or excessive pharmacotherapy, and it may further obscure the patient’s true underlying condition. This is true for all medical specialties—including psychiatry. It behooves us, then, to examine the practice of clinical decision-making, how we do it, and where we might go wrong, particularly in the area of psychiatric diagnosis. According to Pat Croskerry, a physician at Dalhousie University in Canada, the foundation of clinical cognition the “dual process model,” first described by the Greek philosophers (and reviewed here). This model proposes that people solve problems using one of two “processes”: Type 1 processes involve intuition and are largely automatic, fast, and unconscious (e.g., recognizing a friend’s face). Type 2 processes are more deliberate, analytical, and systematic (e.g., planning the best route for an upcoming trip). Doctors use both types when making a diagnosis, but the relative emphasis varies with the setting. In the ED, quick action based on pattern recognition (i.e., Type 1 process) is crucial. Sometimes, however, it may be wrong, particularly if other conditions aren’t evaluated and ruled out (i.e., Type 2 process). For instance, a patient with flank pain, nausea, vomiting, and hematuria demonstrates the “pattern” of a kidney stone (common), but may in fact have a dissecting aortic aneurysm (uncommon). This model is valuable for understanding how we arrive at psychiatric diagnoses (the above figure is from a 2009 article by Croskerry). 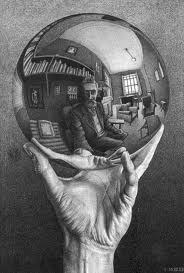 When evaluating a patient for the first time, a psychiatrist often looks at “the big picture”: Does this person appear to have a mood disorder, psychosis, anxiety, a personality disorder? Have I seen this type of patient before? What’s my general impression of this person? In other words, the assessment relies heavily on Type 1 processes, using heuristics and “Gestalt” impressions. But Type 2 processes are also important. We must inquire about specific symptoms, treatment history, social background; we might order tests or review old records, which may change our initial perception. Sound clinical decision-making, therefore, requires both processes. Unfortunately, these are highly prone to error. In fact, Croskerry identifies at least 40 cognitive biases, which occur when the processes are not adapted for the specific task at hand. For instance, we tend to use Type 1 processes more frequently than we should. Many psychiatrists, particularly those seeing a large volume of patients for short periods of time, often see patterns earlier than is warranted, and rush to diagnoses without fully considering all possibilities. In other words, they fall victim to what psychologist Keith Stanovich calls “dysrationalia,” or the inability to think or act rationally despite adequate intelligence. In the dual process model, dysrationalia can “override” Type 2 processes (“I don’t need to do a complete social history, I just know this patient has major depression”), leading to diagnostic failure. Croskerry calls this the “cognitive miser” function: we rely on processes that consume fewer cognitive resources because we’re cognitively lazy. The alternative would be to switch to a Type 2 process—a more detailed evaluation, using deductive, analytic reasoning. But this takes great effort and time. Moreover, when a psychiatrist switches to a “Type 2” mode, he or she asks questions are nonspecific in nature (largely owing to the unreliability of some DSM-IV diagnoses), or questions that confirm the initial “Type 1” hunch. In other words, we end up finding we expect to find. The contrast between Type 1 and Type 2 processes is most apparent when we observe people operating at either end of the spectrum. Some psychiatrists see patterns in every patient (e.g., “I could tell he was bipolar as soon as he walked into my office”—a classic error called the representativeness heuristic), even though they rarely ask about specific symptoms, let alone test alternate hypotheses. On the other hand, medical students and young clinicians often work exclusively in Type 2; they ask very thorough questions, covering every conceivable alternative, and every symptom in the DSM-IV (even irrelevant ones). As a result, they get frustrated when they can’t determine a precise diagnosis or, alternately, they come up with a diagnosis that might “fit” the data but completely miss the mark regarding the underlying essence of the patient’s suffering. Croskerry writes that the most accurate clinical decision-making occurs when a physician can switch between Type 1 and Type 2 processes as needed, a process called metacognition. Metacognition requires a certain degree of humility, a willingness to re-examine one’s decisions in light of new information. It also demands that the doctor be able to recognize when he or she is not performing well and to be willing to self-monitor and self-criticize. To do this, Croskerry recommends that we develop “cognitive forcing strategies,” deliberate interventions that force us to think more consciously and deliberately about the problem at hand. This may help us to be more accurate in our assessments: in other words, to see both the trees for the forest, and the forest for the trees. This could be a hard sell. Doctors can be a stubborn bunch. 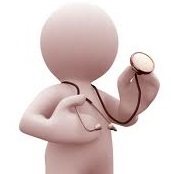 Clinicians who insist on practicing Type 2, “checklist”-style medicine (e.g., in a clinical trial) may be unwilling to consider the larger context in which specific symptoms arise, or they may not have sufficient understanding of that context to see how it might impact a patient. On the other hand, clinicians who rush to judgment based on first impressions (a Type 1 process) may be annoyed by any suggestion that they should slow down and be more thorough or methodical. Not to mention the fact that being more thorough takes more time. And as we all know, time is money. 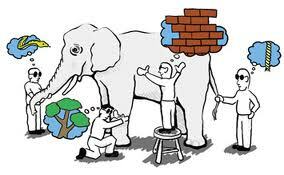 I believe that all psychiatrists should heed the dual-process model and ask how it influences their practice. Are you too quick to label and diagnose, owing to your “dysrational” (Type 1) impulses? On the other hand, if you use established diagnostic criteria (Type 2), are you measuring anything useful? Should you use a cognitive forcing strategy to avoid over-reliance on one type of decision-making? 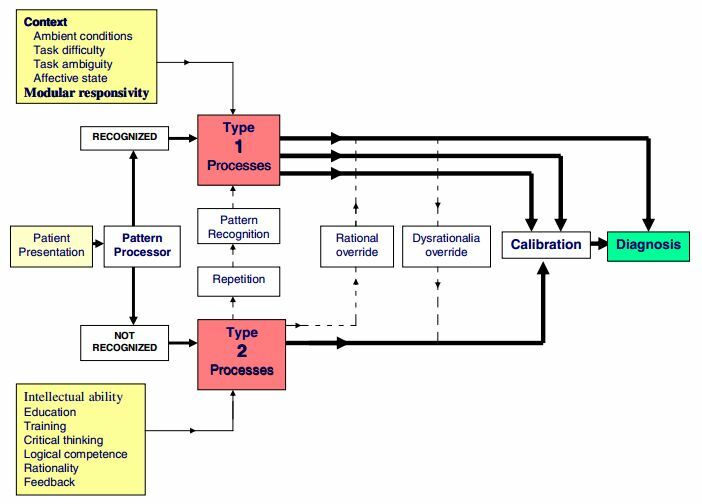 If you continue to rely on pattern recognition (Type 1 process), then what other data (Type 2) should you collect? Treatment history? A questionnaire? Biomarkers? A comprehensive assessment of social context? And ultimately, how do you use this information to diagnose a “disorder” in a given individual? These are just a few questions that the dual process model raises. There are no easy answers, but anything that challenges us to be better physicians and avoid clinical errors, in my opinion, is well worth our time, attention, and thought. This entry was posted on Sunday, March 4th, 2012 at 2:51 pm and is filed under diagnostics, psychiatry. You can follow any responses to this entry through the RSS 2.0 feed. You can leave a response, or trackback from your own site. This is essentially the subject of “Thinking Fast and Slow” by cognitive psychologist Daniel Kahneman. Do you really want to think like a psychiatrist? Actually, it is easy: Diagnose everyone, and I mean everyone, who walks into your office with “bipolar II” disorder. Diagnosing bipolar II for everyone who walks through the door would be a good begining. It would be wrong, by a lot, most of the time, but would have a better chance of being right than other randomly selected diagnoses. The issue is not the Boplar II diagnosis, the issue is treating people who are intractably mentally troubled with something like moodsabilizer monotherapy as a solid trial..
A diagnosis of bipolar II followed by an antidepressant, with a mood stabilzer, with an atypical, a benzo and cognative therapy will virtually certainly make the disorder worse. Especially because alcohol is likely to be added. Gosh, I hate to tell amyone in their learned proffession, but Biopolar II exists, believe it or not. I have the dubious pleasire, as this being my diagnosis and most certainly do not welcome it, I suppose it is a way for you guys to get paid, and we all do what we have to surrvive. Please walk a mile or 25 in my shoes….you do not sleep or need to. I am so exhausted from it – I may be a loser but I have worked since I was twelve and studied many more years as you have as doctors for my profession – continue to do so, I rose to the top of my profession and feel that the lows and highs helped me to be the best I could be. So every time one of you makes a snide remark, please take a walk in my shoes as any doctor that takes care of the actually mentaly ill knows – or should. So, I say,shame on you, for not recognzing this and know we all do the best we can. Thanks for letting me rant and know we all can and should do better! I most certainly strive for this and often fall short, but the climb is worth it! Sorry to be annoymous, but I have a recognizable name in my field. Trust me, it exists, no matter what you call it!